Hello everyone. In case you are eligible to nominate and/or vote for genre fiction awards, here for your consideration are the stories first published by Cast of Wonders in 2017. All of these stories fall into the Short Story category for both the Hugo and Nebula awards. 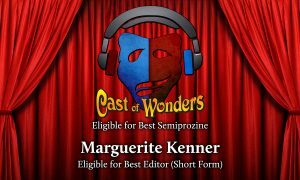 Cast of Wonders is eligible for the Best Semiprozine Hugo award. 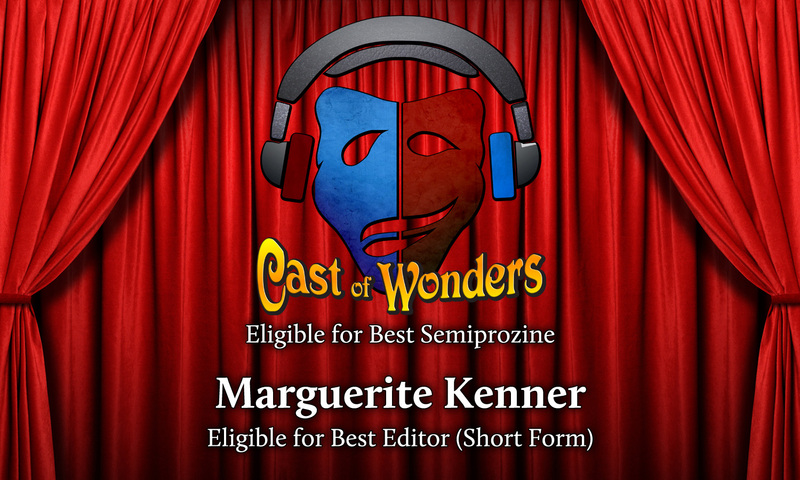 Our editor, Marguerite Kenner, is eligible in the Best Editor: Short Form Hugo category. Hello everyone, this is Alasdair, the voice of Escape Artists. This is our 2016 metacast to present the stories we ran in 2015 which are eligible in the upcoming Hugo nomination season. First, a quick plug four ourselves. 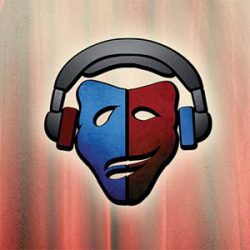 All four EA shows – Podcastle, Pseudopod, Escapepod and Cast of Wonders – are themselves eligible in the SEMIPROZINE Hugo category. Not Fancast. Not Fanzine. Semiprozine. Yes, the categories are confusing and often overlap. Fancast as a category is traditionally dominated by commentary shows and sketch based audio programs. Take at look at the finalists over the last couple of years. Whereas the Semiprozine category is home to the types of publications we consider our publishing peers. While there’s an argument to be made we could split the shows and compete in multiple categories to increase our chances, we don’t think benefits anyone. The division would be artificial at best, extremely difficult to explain given all four of our shows have harmonized pay rates and submissions policies, and smack of gamesmanship which doesn’t interest us. 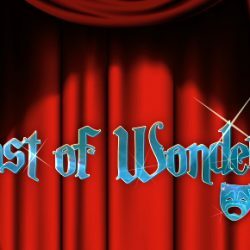 Don’t get us wrong, we LOVED seeing Podcastle and Escapepod on last year’s Hugo long lists, and we’d be honoured for one of our shows to be a finalist. But that’s a decision that rests solely in the hands of you, our fans and supporters. And just a note, Mothership Zeta doesn’t qualify this year because they’re too new. These show notes contain links to a few different aggregation projects, where fiction fans are building cumulative lists of those eligible in the various categories. They’re great tools, and we’d like to thank David Steffen in particular for his efforts. We’ll also link to our Wikia page, containing links to all the stories mentioned.